1.I bought this M-81 Swiss Vetterli at a gun show for $60. I had been altered (I'm not using the B word anymore) by shortening the forestock and decking the roller coaster rear sight, otherwise it's quite original and in great shape. 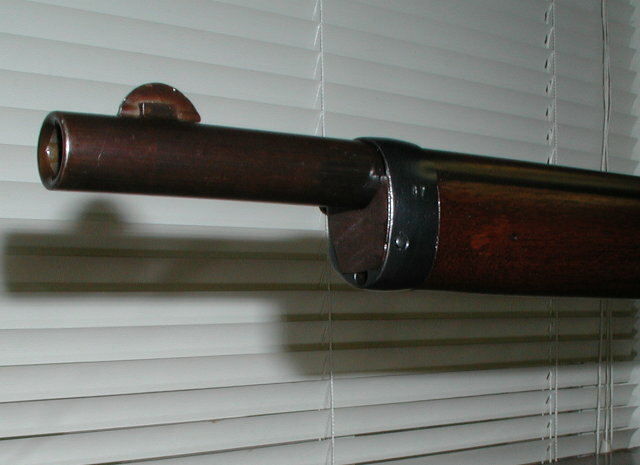 First picture is of the forestock showing the brass tube magazine. It had a small wood extension glued on here that fell off when I was cleaning it. 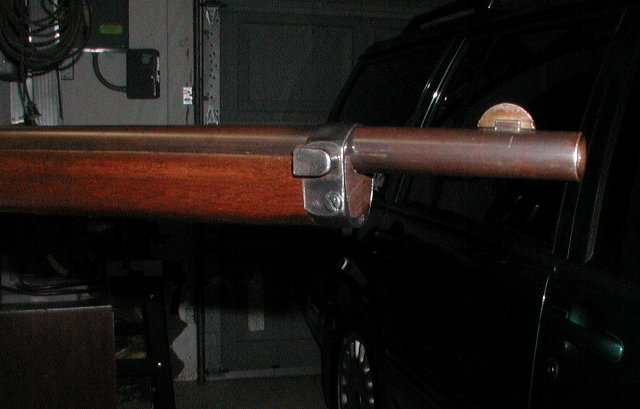 2.This is a picture of a replacement forestock that I made from a walnut Enfield No.1 forestock that matches the Vetterli's wood almost exactly in color and grain. I had to inlay pieces to cover the barrel band relief and the hole for the machine screw. 3.The hard part was drilling a hole into the replacement stock for the brass tube magazine to fit into as I had cut off the original stock at the barrel band so the joint would be covered. 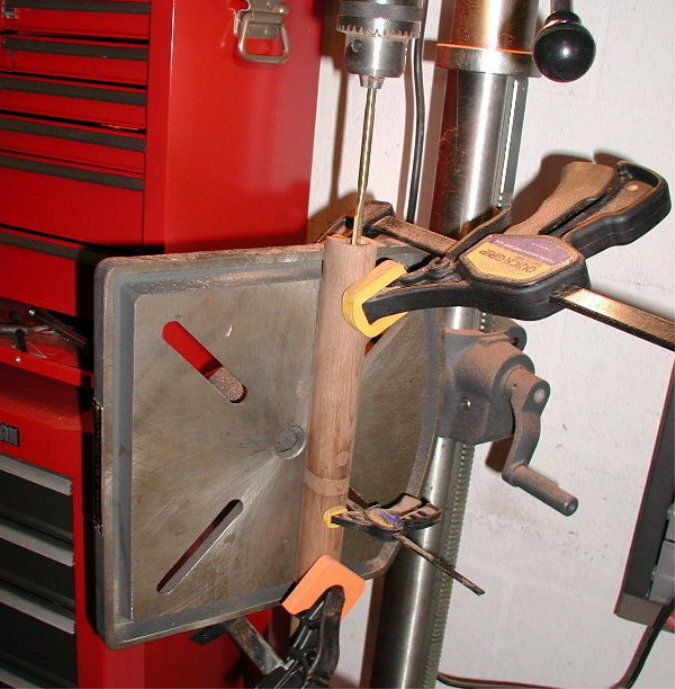 I simply rotated the table on my drill press 90 degrees and using the old hole as a guide to align the drill, clamped the replacement, crossed my fingers and drilled. Any deviation N/S or E/W and the 3/4 bit would have broken through as there was less than 1/8 of wood between the surfaces. 4.Picture is of the almost completed replacement being fitted into the tube mag. 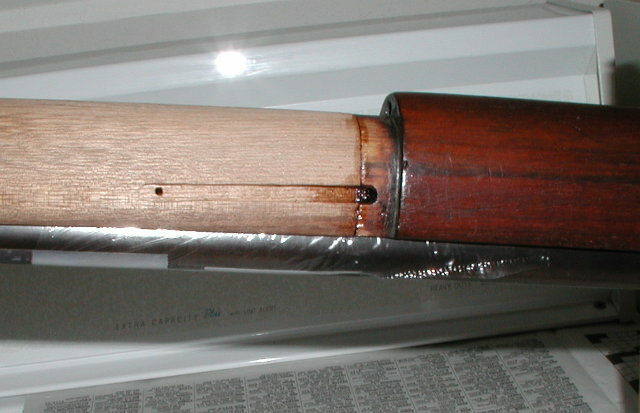 5.Picture is of the replacement with the barrel band in place covering the joint. My purpose is not to counterfeit this Vetterli, but rather restore it to a more original appearance. 6. 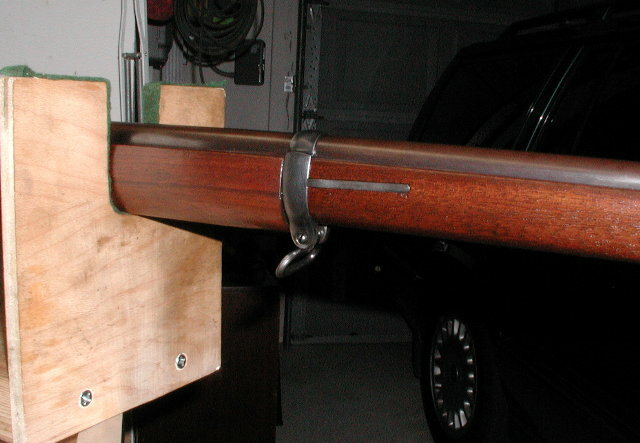 Picture is of the joint between the original chopped stock and the replacement forestock ahead of the barrel band. 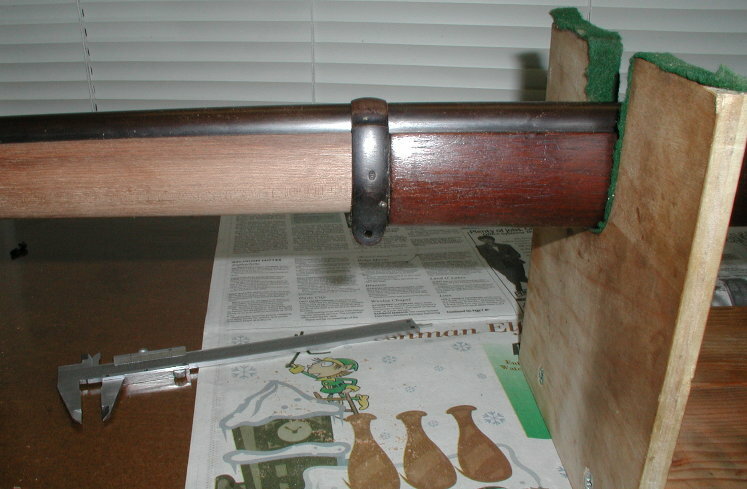 I used toothpicks placed in holes to align the two pieces, but the brass tube magazine provides primary vertical support. Used 2 ton epoxy for the joint. 9. I used a Commission rifle front barrel band as the original was missing. The Commission rifle came the closest to the Vetterli as the bayonet lug was on the correct side and the cleaning rod hole was present. 11. Completed rifle. All for naught however, as I have found a Vetterli front barrel band and must redo everything as the measurements are not the same as the Commission rifle's front barrel band. Ah well, practice.